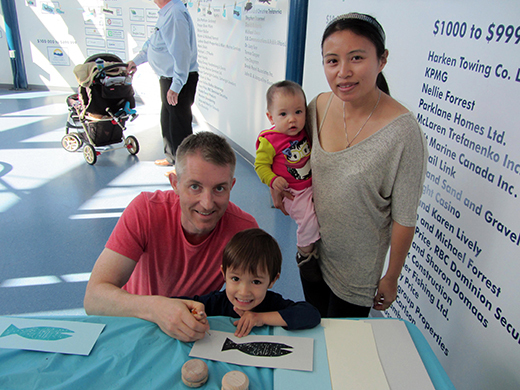 Last Saturday we celebrated families, fish and the Fraser River! 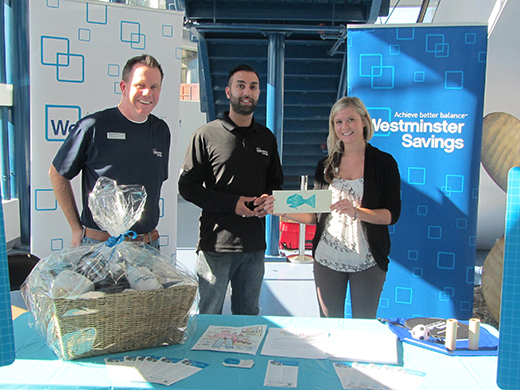 We were excited to join Westminster Savings at their booth at RiverFest, a festival inspired by the Fraser River. 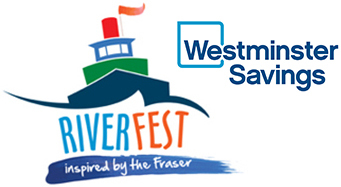 Westminster Savings generously supports our ArtStarts at River Market events that take place once a month in New Westminster. RiverFest took place just outside River Market and inside the neighbouring Fraser River Discovery Centre in New Westminster. It was a beautiful sunny day, with lots of families out and about. 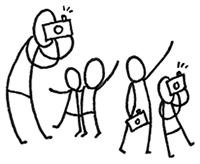 Of course, we invited them over to make some art with us! 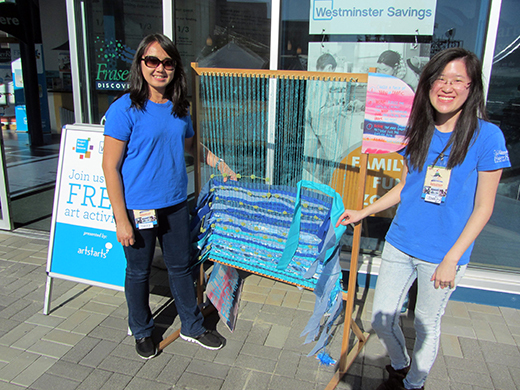 Our loom welcomed people to “weave the Fraser River”, adding pieces of blue and green fabric and yarn to represent the rippling, flowing water. 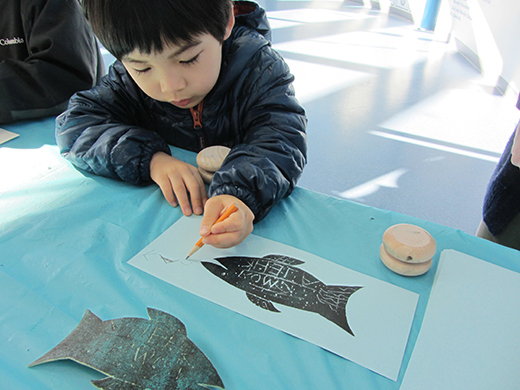 Families also tried their hand at printmaking — many for the first time! 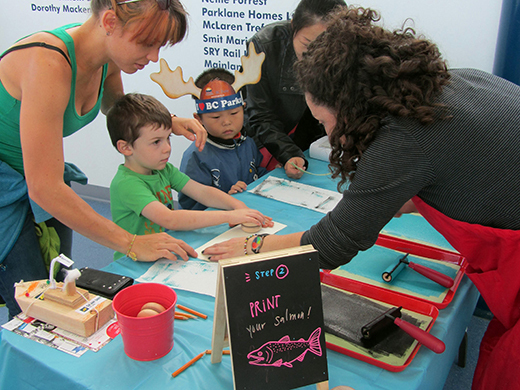 They learned about the many kinds of salmon who inhabit the Fraser River, then drew their own salmon on soft foam. Some kids were very precise in trying to depict a particular salmon, such as the Sockeye, while others boldly invented their own variety. 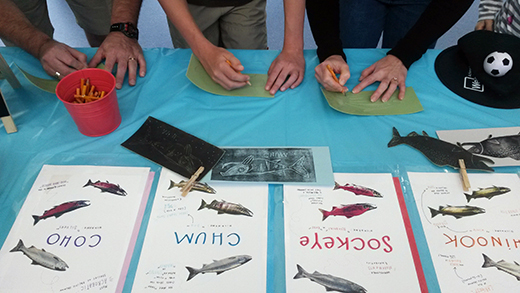 Some families collaborated on a fish and others expressed themselves independently. 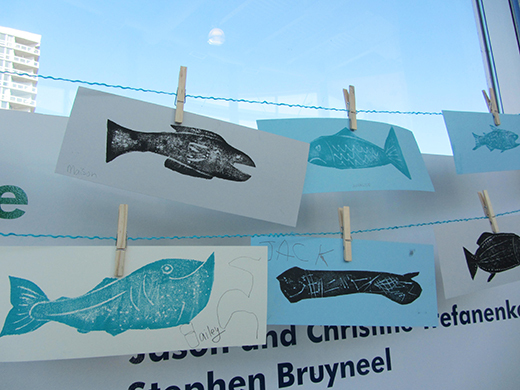 The kids then printed their artwork in black or turquoise ink, making a copy to take home and another to hang in our on-site gallery. By the end of the day, we collected a huge and beautiful school of salmon! Thanks to Westminster Savings and RiverFest for a wonderful, creative day. Check out lots more photos on Facebookfrom RiverFest 2015! We have more free family events coming up soon! Join us at ArtStarts on Saturdays in Vancouver on Saturday, October 31, 2015 and at ArtStarts at River Market in New Westminster on Sunday, November 1, 2015 for Seeds for Bees: A Make and Take-Home Activity to Help Save the Bees with artists and beekeeper Lori Weidenhammer. Sessions start at 11am and 1pm. As always, admission is free! See you there!